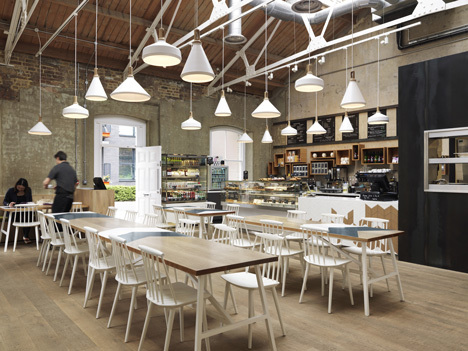 C and S ltd are delighted to have recently been involved in the construction of the Cornerstone Cafe in Royal Arsenal. The cafe can be found in the industrial setting of the former factories and warehouses of Royal Arsenal Riverside, an area famed since the seventeenth century for producing munitions for the Royal Navy and armed forces. The building has been stripped back to a shell, while retaining character and authenticity. Paul Crofts Studio’s scheme for the cafe leaves original features intact and exposed, while inserting new elements to contrast with the existing fabric of the building. C and S ltd enjoyed interpreting Paul's designs and working hard to ensure that every detail of this military design was completed to his and the clients complete satisfaction. A chevron motif derived from the insignia on military uniforms can be found throughout the scheme, seen on the table tops, oak display boxes, and the counter and display wall. The scheme's focal point is provided by the service counter and display wall, the design of which provides a deliberately new intervention to contrast with the rough surfaces of the existing interior. Created from a combination of solid wood and CNC-routed HI-MACS solid surface material in pure white, the chevron motif is inset in an irregular pattern to take the design from wood on one side, to white on the other. Display shelves are edged with a brass trim. All offering challenges for C and S ltd to ensure that the fixtures and fittings in this London cafe refit were completed to a high quality and with extreme precision. At the completion of Westfield shopping centre, the food court had a few casualties, not just unfinished but not approved by the Landlord. While Ooze Risotteria (see above) was completed on time by C and S ltd and met the the high standards set by the Landlord, the Westfield Comptoir restaurant was not so lucky. As C and S ltd had proven itself at Westfield, the owner of Comptoir approached us to refurbish their existing restaurant in Paddington. Although small it was packed with all kinds of finishes - hand made tiles on the floor, a bespoke food counter with a hot section and a chilled section, all finished in black corian. The counters and remaining joinery were all bespoke in the true sense of the word and all carefully fitted into the recesses that are typical of an old London property. The property is linked to the hotel above it and we carried out all of this work without disturbing the guests once. As you can see on our gallery page we created a stunning restaurant interior that also had a small retail section. We were proud of the work we carried out as a true test of our experience. The owner of Coast restaurant saw The Market restaurant and knew immediately that he wanted to employ us for his restaurant fit out. Having created one restaurant interior in Camden London, creating another one in the same road was a treat! Some designs and interiors just work and this is true of some shopfitters - you can drop them into any environment - healthcare, retail, education, industrial and they can just deal with it. Along the way we have created interiors, fitted out, refurbished entire buildings in all of these sectors and have gathered a wealth of knowledge. The owner of Coast restaurant did not have a huge budget and we still managed to create something unique for him as a restaurant interior. Using all of our experience as shopfitting contractors we advised on cost effective floor and wall finishes but still gave him Corian topped tables and a big open planned kitchen so that guests get exposed to the theatre of the kitchen. This blend of experience helped us point him in the right direction and although we did install new ceilings, new walls, new flooring and new commercial kitchen it was all done with an eye on the budget! This interior fit out for Coast restaurant is as robust and eye catching as many others costing much, much more and I believe that this proves that working in partnership with your shopfitter when it comes to interiors of all types will pay dividends in the long run. If you want iconic London then Camden's a good place to start. At the Market restaurant our brief was to create a visual feast, an interior that was unique, comfortable and as iconic as Camden. We stripped out the old restaurant, bar, kitchen and started again. The plaster was removed from the walls to expose old London bricks, these were sand blasted and gave the restaurant an instantly unique interior. To complement this we added an oak floor and left it with an oiled finish so that over time it would develop a patina of its own. Some interior "specialist" contactors use this phrase because they assume that it is all about putting up plasterboard and some of the time it is. However at C&S Ltd we still take pride in the traditional skills in shopfitting These skills let our contractors create something truly unique on site - and Market Restaurant was a project where we could do that. This restaurant was worked on top to bottom and we installed new power, lighting, flooring, decoration, seating and celings. The best part of the interior were the zinc wrapped table tops and old wooden school chairs and counter. All different, some new, some old but all working well to create that unique restaurant interior - a special place created using the skills of a specialist interior company - C&S Ltd.
We had thought that the restaurant in Fleet street London was bold until we saw the plans for Chilangoes Restaurant interior fit-out in The Meadowhall Centre Sheffield. Even with our many years of experience, we didn't realise that any commercial interior or restaurant could be this fantastic! It is true that all interiors start life as all other projects - partitioning, suspended ceilings, floor coverings, decorating, air conditioning, lighting, power - however then you need to add the X factor... you know, the items that turn your restaurant into a stunning bespoke interior. We added concrete vanity units wire mesh suspended ceilings, pink corian, pink leather banquette seating, resin flooring, tiling, polished concrete tiles, a massive shopfront and enough bespoke joinery to meet anyone's requirements. These transformed the interior of this restaurant into the most exciting commercial interior that we have ever created. It was more amazing than any other office interior, retail interior or healthcare interior and we should know... we have built enough of them! London is our playground and although some shopfitters habitually travel the country, we don't. To get one of the best shopfitting contractors in London out of London you know that the project will be good. As interior projects go, this was the most bespoke, unique item we have ever created. Who else could give you a concrete entrance portall, with a pink corian shroud, hidden lighting and a secret roller shutter and all of this is slap bang in the middle of a 15m wide glass shopfront?! To create this magnificent interior, there is a massive amount of hidden structural steel, all neatly fitted in pockets in the walls, tucked behind the bespoke finishes. The steel staircase leads up to a mezzanine floor, an item quite common in commercial or industrial interiors, however this one was as unique as the rest of the interior because it had no steel in it. This was the first wooden mezzanine floor we have ever built in 20 years. On top of this floor we built booth seating, with pink laminate ceilings and walls, hidden recessed lighting and tables that where fixed to the glass fronts of the booths. This is about as cutting edge as it gets for interiors and one of the best from one of Londons best shopfitting contractors! Having just completed the refit of the new 1970's retro restaurant, Gregs Table in Bermondsey Square Hotel for Greg Wallace (Masterchef) I am pleased to say there were no flares, tight football shorts or men with long perms to be seen...mind you I didn't get to meet all of the guests! It was a pleasure to create such a retro environment. Restaurant Interiors are always complicated as there are so many elements to coordinate, but as usual C and S ltd achieved a standard beyond expectation. Having received the indicative scope of works 1 week before xmas, we started first week back in Jan. The works included a new bar with pewter top, besboke joinery to walls, cupboards, displays, bespoke banquette seating . New flooring to the main area, behind bar and kitchen area. Full redecoration of the restaurant and hotel reception. Redirection of all existing services which included power, water and drainage- this entailed digging up the sub floor and making good. We were on site for three and a half weeks and produced a superb finished product. I don't know about Masterchef, but Master Restaruant Contractors - Definately!! The counter was built externally and we then added the external cladding onsite - We managed the entire fit out of the unit for Yalla Yalla. From sketch to finished product we managed to turnaround this project in four and a half weeks. How do you describe Chilango's? These are simply the very best restaurant fit outs utilising all of the best materials, creating all of the restaurant interiors. This was Construction and Shopfitting showing London why we really are the best shopfitting contractor! We do specialize in restaurant fit outs and refurbishments and do we make them special. All of the finishes for this project were specialist and we managed to finish it early for them. No other restaurant interiors can prepare you for this interior fit out - from the reclaimed corian tables to the bespoke counters and bars, Chilangos restaurant fit outs provide a specialist restaurant fit out contractors dream. The specialist joinery created a truly bespoke interior! Before we could start the fit out we had to strip out the old pub removing the existing bars and commercial kitchen, taking out the old chimney and propping it all up on specialist steel work. This was a very small space and we crammed in a full prep kitchen and a main kitchen for cooking, all of this gave this very special restaurant interior an added dimension, something you only get with a one of Londons best shopfitting restaurant fit out contractors! After completing Chilango's in Fleet Street, the Company realised that now they were working with one of London's best shopfitting contractors so they could really push the boat out. We refurbished their existing restaurant in Upper Street, London fitting it out with corian counters, new commercial kitchen , new floor covering and decoration throughout. The lighting and power was changed to give the restaurant a truly bespoke look and feel. As with all commercial interiors, air conditioning was installed through out. To ensure that the interior met the highest standards, all of the doors were upgraded to fire doors and a new fire alarm system was installed. The programme was absolutely insane and we accomplished this in 12 days and to add to our workload we also carried out some structural alterations and swapped the shop front as well. Anybody who understands restaurant interiors as we do, will realise just how big a challenge this was. It just goes to show that, with a very determined team, you can achive the most amazing interiors in a very short space of time. Ask a shopfitter to create a ship in a bottle and this is what you get. We built a unique restaurant interior inside one of the most unique shopping interiors in Europe! As interiors go it was special, lots of corian, bespoke joinery, commercial kitchen, cold displays, hot displays and bespoke glass products to display the produce. The corian counters were backlit to reveal the routed logo. The oak timber panelling was cut and formed on site, each little rebate measured and produced by us to the client's exact instructions. This was old fashioned shopfitting, in a modern interior. It just so happens that we were creating a bespoke restaurant interior but we could have been making a retail interior or healthcare interior, such was the level of detail on the joinery. To create the skeleton of the restaurant we used traditional stud and board partitioning and a lightweight MF suspended ceiling. At this point it could have been any interior but we slowly added the bespoke joinery, truly unique and bespoke corian counter, a commercial kitchen, power and lighting, flooring. However the wall covering was a brass cladding, all neatly folded and seamed, covering floor to ceiling on certain elevations. To reinforce the simple fact that we are one of London's best shopfitting contractors creating all kinds of bespoke commercial interiors we finished this project on time, allowing Ooze to open when many others did not and in a shopping centre environment that is everything! It is always flattering to be asked to refurbish or fit out any commercial interior, healthcare, restaurant, office interior - the buzz is always the same. However when you get asked to rectify another contractor's work at a restaurant's Head Office, you know that they really consider you to be one of London's best shopfitting contractors. This was a simple make over for us: decorations to the partitions and suspended ceilings. We replaced the floor coverings and fettled with the bespoke seating and commercial kitchen. We recreated their unique brand by upgrading the interior to how it should have been carried out by the original contractors! Having just completed the refit of the head office interior at the Fine Burger restaurant, we were delighted to be awarded their first shopping centre fit out. This is one of the most complicated places to create any unique restaurant interior, however as usual C&S triumphed. We were presented with an old American diner and had to turn this into a cutting-edge burger restaurant! We installed all new suspended ceilings, partitioning, new floor coverings, lighting, power and miles of wall battening. This project involved lots of bespoke joinery - counters, waiter stations, bars and bar tops. We created luxury toilets all fully tiled. As refitted restaurant interiors go this was an extremely nice place to sit and eat. And the entrance of the restaurant was a full height partition wall, all finished in Fine Burger's distinctive, purple corporate colour. With another Fine Burger restaurant under our belt, we went on to fit out their new restaurant in the Excel Arena in Docklands London. Although this was a small kiosk fit out, it had all of the main components that a main restaurant fit out would have to create a commercial interior but in miniature! Somehow we squeezed in a commercial kitchen, bespoke counters to serve from, elegant storage solutions, retail storage and completed the fit out in 10 days. In creating this restaurant interior we had to have all of the normal suspended ceilings, partitions, flooring, electrical installations and decoration. Working closely with the designers we managed to fit this restaurant out and create an amazing interior, again, taking us to work in other locations fo the Fine Burger restaurant company. Another restaurant, another kiosk fit out for Fine Burger. However, fitting all of the items needed in this kiosk for a fully functioning restaurant was nothing short of a miracle! This is perhaps the smallest interior project we have ever completed. Bespoke usually means a one off and this really is the case with this project and however you want to dice it - we did create a bespoke specialist restaurant interior in miniature. A custom interior by a custom interior specialist! Working right next door to one of Londons iconic stadiums, we were given a tight challenge, remove one restaurant interior and create a new interior - nothing bad about that, that is what we do. However this one had to be done in between matches and out of hours! Once the old interior and commercial kitchen had been removed, we began to create one of the specialist interiors we are well known for. Up went the suspended ceilings, in went the light fittings, down went the tiled floors, out of the boxes came the commercial kitchen, in went the bespoke joinery to create bars and counters to serve at, unique storage items and beautiful timber doors. A specialist interior contractor will give you a specialist interior whether or not your bespoke interior is for office, healthcare, education or restaurant. We managed to create the restaurant interior in the time allowed, with panache and flair. All as you would expect from one of Londons best shopfitting contractors. C&S on tour again! Singapore Sams restaurant goes bust, Fine burger restaurant need to move in and who do they call? Construction and Shopfitting, one of London's best shopfitting contractors. In just 10 days we gutted the old restaurant interior, fully tiled the new one which included floors and walls, dropped in a new suspended ceiling, adapted the services to create the new layout for the commercial kitchen and then created a serving counter all from bespoke joinery and UV bonded glass. We fitted this restaurant out so quickly that we created at bit of a stir amongst the locals and were awarded another contract in the shopping centre to fit out a coffee cafe. Not a full blown refit or fit out this time. We were asked to move the existing counters, create some bespoke joinery in the form of tables and bar, fit new wooden flooring through out, decorate through out and get out as fast as possible. A simple face-lift this time, new decoration through out, more bespoke joinery manufactured off site and then fitted on site and new wooden flooring through out. Sounds simple and it was, for one of London's best shopfitting contractors. Whilst we were beavering away on the Fine Burger Restaurant in Swindon, we were approached by the owner of the Italian Caféwho had been let down by another shopfitting contractor. Having one of London's best shopfitting contractors working on the neighbouring unit was too good an opportunity for them to pass up. Once we had agreed the scope of works we got on with it. In went the suspended ceiling, up went the stud walls, in went the flooring with the electrics following not far behind. The beauty of employing C&S to carry out refurbishments or fit outs in either education, healthcare, or restaurant is that we have experience of creating these interiors before. The team is truly a team and we work to a common goal of creating the correct interior for the sector we are in; we simply perform to the best of our abilities to create your ideal interior. The counters were one of the last items to go in and as usual with a bespoke item from C&S looked the part and provided the client with a functional display for their products. To conclude, we went to Swindon to fit out a burger restaurant and whilst we were there fitted out an Italian Café as well!!!!! As one of London's best shopfitting contractors it is not unusual to be asked to create an amazing interior, very quickly whilst making no noise and not affecting normal business! This is pretty much what we did at Fenwicks in Bond street London. Out of hours we erected the temporary screens, removed the existing bar and services, cleared the restaurant of tables and chairs and got on with it. In the rear we installed hygienic cladding to the kitchen walls, fitted new flooring and new suspended ceilings, in went the lights, electrical and plumbing installations. Then the bespoke kitchen with stainless counters and tables. Not a bad looking interior to work in, we thought! However we were far from complete as we had a unique bar to build. If you want "wow", then do it with corian. Nothing comes close to providing this unique look and C&S Ltd are one of the few corian approved contractors who can fabricate and install this material. The bar is leather clad with a corian top and a "floating" shelf on hidden brackets. If you are going to create a bar/restaurant interior then you may as well do it right and we added masses of American black walnut to the restaurant area. This gave it a real traditional feel to the bar area and made the interior a very pleasant place to be. To create this interior in the middle of London, inside one of London's premier retail stores you need a reliable shopfitting contractor - I am very proud that Fenwicks felt that C&S Ltd fitted the bill and that we delivered what they wanted, the way they wanted it done and to the agreed budget. The pub was undergoing a refurbishment and the owners had the "builders in". It is often assumed that builders and shopfitters do the same thing, which is quite an assumption! It soon became apparent to the owners that their builders were not up to the job and they went looking for a shopfitter to help them achieve the bar/restaurant interior that they were trying to create. We are pleased to say that they found us! Within no time at all we had created a new bar - all in white corian (see Gallery) which gave them a real wow factor. Then we moved our attention to the back bar and created a unique stainless steel bar to house all of their drinks and other produce. Behind the back bar we installed back lit mirrors with sand blasted patterns on them. To complete the bar/restaurant interior we manufactured banquette seating, which was curved to maximise the space. To compliment these, we manufactured and installed new curved tables. We also went on to carry out all of the decorations within the bar and restaurant area ensuring that C&S Ltd had helped to create this stunning bar/restaurant interior in one of London's trendiest areas. Westfield was a little jewel in our crown, a glowing beacon for C&S Ltd. For some contractors it was a crown of thorns when they did not complete their clients' projects on time. As a shopfitting contractor we punch far above our weight in the world of commercial interiors: we create stunning interiors AND we provide something extra, that personal touch. This cannot be costed and it cannot be found in a quotation. The interior and fit out in general at Ooze Restaurant in Westfield shopping centre was stunning, you have so many quality materials that it had to be a winner. We had the normal elements that go into any fit out or refurbishment- suspended ceiling, partitions, electrical installation, plumbing, commercial kitchen and flooring. However we then added the icing on the cake - corian displays, corian counter, marble counter tops, bespoke joinery to the walls and cabinets below the counter. The gold wall cladding is actually a roofing material that we very cleverly used as a wall covering, not a use that the manufacturers ever expected! The main front counter not only has corian, UV bonded glass but hidden chillers that blow cool air across the food to keep it cool - this is truly unique, truly one of a kind. The bespoke joinery in this restaurant interior could easily be found in a bar or club as it displays the bottles of water. Not just any old display mind you, this is backlit to provide that extra something. Back to that crown of thorns - all around us the contractors responsible for creating the Apple, addidas, timberland and other stores all worked long into the night to accomplish their targets and so did we, however we achieved it whilst others failed and the opening day at Westfield was a cash bonanza. Imagine siting on the side lines whilst all around you others struck gold and all because you used the wrong shopfitter! If you want a stunning interior, executed the best way possible by a contractor who cares, please do call C&S Ltd one of the best shopfitting contractors in London. Not only do we care but we really are good; whether you want a stunning retail interior or casual fast food restaurant or retail emporium we have the experience to carry this out. At the completion of Westfield shopping centre, the food court had a few casualties, not just unfinished but not approved by the Landlord. While Ooze Risotteria (see above) was completed on time by C&S and met the high standards set by the Landlord, the Westfield Comptoir restaurant was not so lucky. As C&S had proven itself at Westfield, the owner of Comptoir approached us to refurbish their existing restaurant in Paddington. Although small it was packed with all kinds of finishes - hand made tiles on the floor, a bespoke food counter with a hot section and a chilled section, all finished in black corian. The counters and remaining joinery were all bespoke in the true sense of the word and all carefully fitted into the recesses that are typical of an old London property. The property is linked to the hotel above it and we carried out all of this work without disturbing the guests once. As you can see on our Gallery page we created a stunning restaurant interior that also had a small retail section. We were proud of the work we carried out as a true test of our experience. Although we completed our side of the works delivering a restaurant with an amazing interior we were not paid - this was all achieved with sleight of hand and dishonesty. If you are planning to work with TONY KITOUS or ATIF AMIN can I advise that you walkaway, however promising it appears they have done this to others as well. Yalla Yalla have asked C and S ltd to complete a container as a transportable restaurant. This follows on from our speedy creation of an eye-catching Yalla Yalla food outlet in a London train station. This time, we thought it would be a good idea to share the progress of this unusual project. These photos show the various stages involved with the project. The next stage involved the refit of the interior by adding a stainless steel kitchen all made ready to fit into the container. The outside serving area was finished in Stainless steel and the interior finished in laminate tops and a lovely bright yellow. Well our guys have worked in some interesting spaces before, but none quite as challenging as this one...still for an experienced shopfitting company it was no problem! Proving that we really can take on any challenge and produce fine quality in surprising conditions. Once the container had been refit it was time to get it to site. You can see from the pictures that this required the assistance of an enormous crane. Just the final touches to add...the signage...and then all done...what a transformation! We are well known as shopfitters but perhaps we should start calling ourselves container fitters! October 2012 and summer is over so it's time to take the container away. Yalla Yalla has proved to be extremely successful being parked at South Bank, but it is now time this fantastically refurbished 'restaurant' to move on to pastures new. Take a look at our Gallery to see images of other restaurant fit outs. For the next two weeks the Bermondsey Square hotel and the refit completed by C and S ltd in Greggs Table and on the 7th Floor is on TV!! "The 90-bedroom Bermondsey Square hotel in London is being transformed into Hotel GB - the location of Channel 4's new reality TV show. The hotel, which is managed by Bespoke Hotels, will feature Gordon Ramsay and Mary Portas in the role of joint general managers, with support from Phil Spencer as maitre d', Kirstie Allsop as concierge and Hilary Devery as manager of the hotel shop. Other key personalities include Gok Wan as bar and events manager, Dr Christian Jessen as manager of health and wellbeing, Katie Piper as spa and salon manager and Kim Woodburn as head of housekeeping. As well as providing a training opportunity for a group of unemployed people who are looking for a break in the industry, the programme will also raise money for The Prince's Trust and Springboard. Robert Holland, the hotel's GM, said he agreed for Bermondsey Square to be used as the location of the programme after being approached by the producers, Optomen. "As an independent hotel, I am always keen to look at ways of publicising the hotel in unconventional ways," he explained. Holland said that the hotel is now closed for two weeks to regular guests - this week while Optomen prepare for the programme and next week while filming takes place. However, bookings are now being taken from members of the public who can stay in the hotel or visit the spa and restaurant during the filming of the series. The level of transformation and intrusiveness that is currently taking place has surprised Holland, "I thought that there would be a lot of false walls and props, like panto, but what has transpired is quite different and the hotel looks great with it," he said. "I will be keeping some of the styling and I trust that there will be a legacy and people will remember us for our involvement in the programme." Holland's team of staff will be on hand throughout the filmng to ensure that the support and training is provided to ensure the hotel remains fully operational. The essence of the programme will pit a team of boys, led by Ramsay, who will oversee the restaurant, bar and gym, against the girls' team, headed by Portas who will be in charge of rooms, reception and spa." Hotel GB will be screened every night for one week, from Monday 1 October. Congratulations to La Petite Bretagne, the recently converted Cafe by C and S ltd. La Petite Bretagne has been short listed for the 2013 Bar and Restaurant awards and we are not in the least bit surprised. It's incredible design by Paul Croft studios and it's excellent execution by C and S ltd have all assisted in the cafe being short listed. We wish La Petite Bretagne and Paul Croft Studio all the very best of luck with winning the award. C and S ltd just want to take this opportunity to wish all those in the finals at the Restaurant and Bar Design awards 2013 the very best of luck and especially Paul Croft who we completed La Petite Bretagne for. With so many talented designers in and around London it must be tough job for the judges at the Restaurant and Bar design awards, but having worked with Paul Croft and completing this sensational design we are backing him all the way as a winner. C and S ltd have completed works now in both Brighton and Yeovil for Pizza Hut as part of their roll out programme due to commence in 2015. The works have involved creating new Ice Cream and Salad Areas in the restaurants. We are looking forward to our next restaurants to really establish our working relationship with Pizza hut and enjoy the process of refurbishment and refit of these restaurants moving forward. The restaurants are nationwide which is a step outside of our usual working area of London, but it just proves once again how versatile C and S ltd are. C and S ltd also completed a significant amount of external works on these projects. The Cornerstone Cafe, designed by Paul Croft and built by C and S ltd is a finalist in the Restaurant and Bar Awards 2014. The project completed by C and S ltd in 2013 is a finalist in the Fast/Casual category. The project involved a great deal of clever design and construction from all the parties involved. The project comprised of new flooring, kitchen area, Mechanical and Electrical, bespoke joinery and cold counters. I am sure you will agree it turned out to be a sensational project in terms of Construction and Shopfitting ...No surprise it is a finalist in the Restaurant and Bar Awards 2014. Another sensational project from Restaurant Contractors in London, C and S ltd. It's time to celebrate - On Thursday night a project completed by C and S ltd - The Cornerstone Cafe won best Fast/Casual Restaurant Design in the 2014 Restaurant and Bar Design Awards. C and S ltd are delighted with the news. The design was truly inspirational and it was a pleasure to work with the designer Paul Croft to create his vision in terms of a cutting edge design in Restaurants. It's great to be award winning contractors. C and S ltd would like to Congratulate all of the Award winners in their categories. C and S ltd offer refit and refurbishment in many sectors including, Restaurants, Bars, Dental, Education, Leisure, Retail, Healthcare and Offices. If we can offer you an award winning service please give us a call especially for any Restaurant fit out contractor projects in London. C and S Ltd have finished the Caffe Vergnano at Mark Lane and it is ready for it's grand opening. The tree inside the cafe certainly creates a talking point too. This coffee shop refit and restaurant refurbishment resulted in an amazing restaurant and coffee shop in London. As specialists in interior fit out for Restaurants C and S Ltd completed the stunning project. Caffe Vergnano 1882 has been voted ‘Coffee Shop of the Year’ by What’s On magazine, and Giles Coren, restaurant critic at The Times, drops by from time to time, referring to the company as ‘the only purveyor of food and drink in the world whose premises I am unable to walk past without entering’. An exciting time for Caffe Vergnano and we wish them all the very best after their sensational fit out in Mark Lane. Perhaps you are looking for restaurant fit out company or you have some refurbishment works that you are looking to complete? Give C and S Ltd a call and we will demonstrate to you that not only are we a competitive company in terms of cost, but that we also ensure our quality is second to none. C and S Ltd Restaurant Contractors in London and surrounding areas. The talented team at C and S ltd have produced another fantastic restaurant for La Petite Bretagne on Clapham Park Road. The site is clean, crisp and delivers excellence and quality, proving that C and S Ltd are really very talented at Restaurant fit out's in London. La Petite Bretagne is an exciting, forward thinking new brand in the restaurant market in London. The restaurant produces fine crepes and galette to the highest of standards. It promotes a social, warm, friendly atmosphere, with a touch of European design. Since its establishment, in Hammersmith a couple of years ago, which Construction & Shopfitting Ltd completed, the owner Antione Detrie has been busy planning his next store which was opened in June 2016. Antoine intends to open several restaurants around London but is growing his business steadily. The Hammersmith store proudly received an award for best Fast Food design in 2015 in the Restaurant and Bar design Awards 2015. Of course we were proud to be associated with this award winning project having completed the restaurant refurbishment in London. • Developing a store that promoted quality and design. • Creating a store to compliment the current stores in Hammersmith. • Ensuring the store remained contemporary, whilst promoting a social environment. • Providing a working kitchen. • Maintaining an established brand identity in the design. C and S Ltd had to ensure all of these issues were addressed in the refit along with Paul Croft, who designed the store, and Tony Richardson the Architect to ensure maximum client satisfaction. • Stairs redecorate and stainless steel handrail. • Lighting, curtains, glass manifestation. This was the fit out of a shell. The building was empty. It was located on a main road in Clapham Park. During the fit out our team came up against many challenges including Graffiti all across the external wall. C and S Ltd Restaurant contractors in London. As a restaurant fit out contractor, it was pretty imperative that we turned up at The Restaurant Design show...and it was a good job we did. With many restaurant design companies exhibiting it was the ideal show for us to find partners to ensure our clients are always given the best service and an appropriate referral from C and S Ltd. The restaurant market is unique. Creating just the right ambience, menu and supplying the right number of covers is a challenge to ensure maximum profitability. Thankfully C and S Ltd have a great deal of experience in the restaurant fit out and refurbishment market and have had the pleasure of working with a number of fantastic designers that can offer a variety of different designs based on the clients brief. C and S Ltd recently completed a restaurant refurbishment in London on Mark Lane for Caffe Vergnano. The design involved putting a live tree in the middle of a table. It looked extremely contemporary when it was finished. The relationship between designer and contractor is one of significant importance if the client is to receive exactly what they want for their restaurant, not only is it key that the two parties can work together, but also that they appreciate each others roles and the limitations of the design to ensure that it can completed on budget and on time. A visit to The Restaurant design show allowed us to meet with new designers and to see some of their works and hear about some of their clients and their expectations. We also met with some new franchisee opportunities for various new restaurant opportunities, again these contacts are extremely helpful in the fit out and refurbishment of restaurants in London or any major town or city in the uk. The Restaurant design show not only provides us with the opportunity to meet with designers but also to understand what type of new technology is being introduced into the restaurant market, making it easier for us to work with our new clients. We really enjoyed the show and look forward to working with some of the new contacts we made. If you are looking for a fit out or refurbishment for a restaurant that you have already had designed then we would be delighted to offer you a competitive quote. If you are looking for a restaurant fit out or refurbishment and need the designs completing, then why not get in touch then we can recommend a designer to suit your brief. We have worked with many national companies too that have their own in house design teams and are looking for a roll out program. It may interest you to know that C and S Ltd not only fit out and refurbish restaurants but we also have a small works and maintenance department that can provide a service of anything from changing a wall, to replacing a kitchen to fixing a broken lock on a door. Perhaps you would like a restaurant contractor in London? If so we are here to help. C and S Ltd were delighted to be awarded the Best Full-Service Interior Design Company 2017 - UK by the 2017 Sustainable Building awards. After all the years of working so hard to produce outstanding results for our clients, surely it was only a matter of time before we received an award for all the efforts that our team put in, and this week we were delighted to be told that we had achieved the award for the Best Full-Service Interior Design Company 2017 - UK from the 2017 Sustainable Building awards run by Build News. We were over the moon to be given an award that proves that our company can provide our clients in Restaurant fit out, Healthcare refurbishment, Office refurbishment, Dental practice fit out and Retail fit out in London with a service second to none. To be awarded a title with the Best Full Service in the title, helps to demonstrate that for us, it is not just about completing the tasks that our clients can get from anyone. We offer a turnkey solution that ensures that our clients can hand over the keys at the beginning of the project and walk back at the end, and all they have to do is move in...in some cases, we can even do the moving in part, they simply have to show up and enjoy their new space. C and S Ltd work in all commercial buildings in and around London. We can offer a range of services from a half day handyman service up to a full £2m fit out or refurbishment. Office Refurbishment: C and S Ltd work with many offices in London, from Maintenance to full refurbishment projects with over 90% of our clients awarding us with repeat work. Dental Fit Out: C and S Ltd have worked with several private dental practices in London to transform their practices to ensure that their reputation is enhanced by their beautiful surroundings. Retail Contractors in London: We have completed some sensationally designed stores, from Penhaligons on Regents street to Godiva all over London. Healthcare Contractors: We work with many NHS trusts all over London in terms of small works and maintenance and fit out and refurbishment. Education refurbishment works: We have worked in many schools around the county of Hertfordshire and within London working on small projects to assist in maintaining their schools. So if you are looking for an award winning company to complete your London project, then get in touch - I'm sure we will be able to assist. Office Contractors: Dental Contractors: Retail Contractors: Healthcare Contractors: Restaurant Contractors: School Contractors.